There are a lot of good reasons to go bicycle touring… and a successful bike tour can totally transform your life. But if you’re anything like most people, you have some fears, objections or obstacles that are either slowing you down or entirely preventing you from conducting that incredible, life-altering bike tour you’ve been dreaming about. Today I want to let you know that there are ways to overcome those various obstacles and live out your dreams of traveling by bicycle! Watch the video above and use the notes below to discover how bicycle tourists raise the money for their bike tours, how they negotiate time off work, get their friends and family members to support your dreams, overcome serious health issues and a whole lot more! Bicycle touring is cheap. Short (and even long-distance) bicycle tours can be done for small amounts of money. Once you have a bicycle and some way of carrying your belongings, short bike tours (lasting 2-7 days) can be done for as little as $50 USD. Longer, more luxurious tours (even bike tours on the other side of the planet) can be done for as little as $600 USD per week. 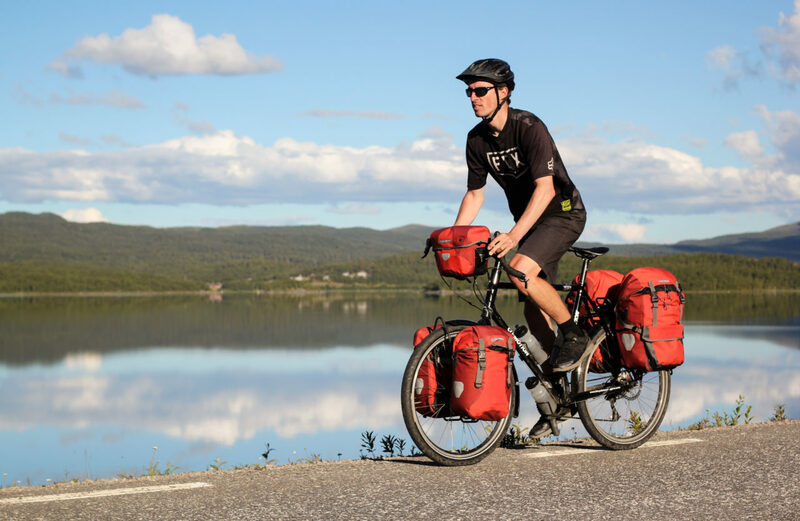 Besides the fact that cycle touring is a cheap mode of travel, there’s also the fact that the average bicycle tour is only 1-2 weeks in length… so most people can afford for at least 1-2 weeks of bicycle touring each and every year. The vast majority of people who go bicycle touring do so by simply saving up the necessary funds and then burning through their savings while they are on their bike tour. Other bike tourists raise the money for their bike tours by selling their unused and unwanted possessions – whether that be clothing, old bikes, tools, cars, and (in some instances) their houses and businesses. There are, however, some people who travel by bike who do so by working and traveling at the same time. If you are struggling to find the time you need to bike tour each year, keep in mind that most bicycle tours are 1-2 weeks in length… and most people get at least 1 to 2 weeks off of work each year for vacation. In many parts of the world, workers receive 1-2 months off of work, so if you live in one of those parts of the world, you have more than enough time to conduct an incredible bicycle tour. If you don’t currently receive enough time off work each year, you need to negotiate more time off. Almost everything in life is negotiable, so keep that in mind as you move forward. Finally, if you can, try and figure out how you might be able to work while you are traveling. This is a great approach for those planning to be on the road for several months or years on end. If you need more help finding the free time, negotiating time off of work, or figuring out how you can work and travel at the same time, then I highly suggest you read the book, “The Four-Hour Workweek” by Tim Ferriss. Sometimes, when you tell your friends, family members and loved ones about your plans for traveling by bicycle, they might be a little hesitant and fearful. Sometimes they downright forbid you to do it! But one of the best things you can do to get your friends, family members and co-workers on your side is to show them that there are hundreds and thousands of people all around the world who are conducting bicycle tours of various types. Show them the www.bicycletouringpro.com website! Show them some of the videos on the Bicycle Touring Pro YouTube channel. And show them “The Bicycle Touring Blueprint.” Once they see that traveling long distances is possible, they’ll be more likely to support you on your journey. If you really want to get your friends and family members behind you, start by conducting short overnight bike tours near your home. Then, once you’ve done a couple of those, start to slowly increase the number of days you spend on the road and the distances you cover. Once your loved ones see that you are capable of touring for a few days, they’ll be more likely to support your idea of traveling much longer distances on your bicycle. Finally, the best thing you can do to gain the support of your friends and family is to be as knowledgeable as possible on the subject of bike travel. Read the books, study the videos, know how to make the necessary repairs to your bicycle, map out a feasible route, and then approach those that you love with your big bicycle touring plan. When they see how knowledgeable you are on the subject, they’ll be a million times more likely to support you and believe in your future success. The vast majority of the people who go bicycle touring are 45 – 75 years old… with the second largest group of bicycle tourists being 18 – 32 years of age. So, if you fit into one of those age groups, know that you are not alone! There are a lot of people your age you are bicycle touring. You are not too old… and you are not too young. In fact, there are lots of kids and even babies who have gone bicycle touring all around the world. Babies have been known to ride on trailers on the back of their parents’ bicycles… and teenages can often times ride bicycles of their own alongside their parents. Plus, there are quite a few people who are 75+ years old who are traveling by bike. I regularly receive emails, messages and comments here at Bicycle Touring Pro from people who are 85 years old and older who are still out riding their bikes. You can do it too! If you can ride a bicycle (or a tricycle) around your local neighborhood, then you can go bicycle touring. I’ve helped hundreds of people over the years who were blind, deaf, diabetic, overweight, out of shape, and suffering from cancer, previous heart attacks, etc… and all of them were able to overcome their various health conditions and conduct incredible bicycle touring adventures. Obviously, I’m not a doctor and you should consult with your doctor before conducting a long-distance bike tour (especially if you know you have a health condition), but you shouldn’t necessarily let the fact that you have a health condition prevent you from conducting that bike tour you’ve been dreaming about. Finally, remember that bicycle touring is good for you! It’s a great way to get in good shape, improve your cardio, lose weight, and a whole lot more! 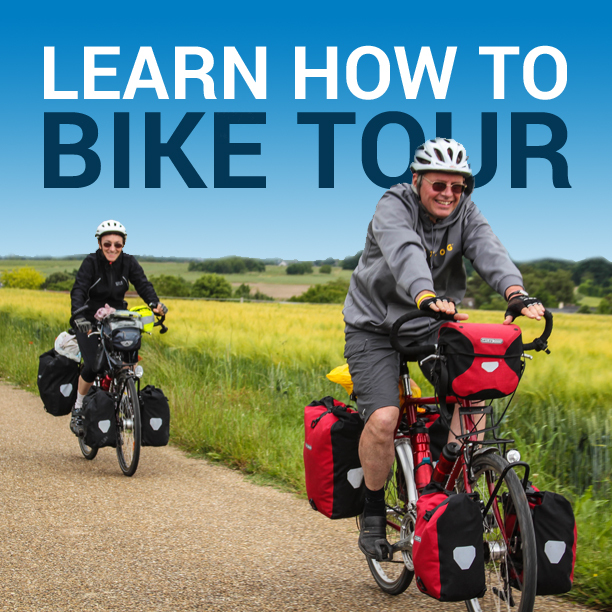 Instead of seeing your health condition as something that might prevent you from conducing the bike tour you’ve been dreaming about… start looking at your bike tour as the thing that might just improve your health condition! Lastly, there are a great deal of fears that people have about traveling by bike. Fears about the people you might meet on the road, animals you might encounter, the potential for theft or robbery, and a whole host of other fears and anxieties. Having those fears at the start of your bike tour is normal, but once you get out on the road, you’ll begin to see why many of the fears you had at the beginning were really nothing to be worried about. You’ll discover that, for the most part, the world is a friendly place and most people in the world are kind, generous people who simply want the best for themselves and their family. One of the best things you can do to overcome your fears is to, first of all, educate yourself… and secondly, to get out there and face your fears! You’ll be a better person for having faced your fears… and the world will be a better place as well. Before you go, take a moment right now and leave a comment below. In your comment, let me know at least one thing you learned from this video/article. Thanks! This entry was posted in Bicycle Touring Pro Articles, Featured How-To Articles, Main Articles, Main Featured Articles, Uncategorized, Videos and tagged age, bicycle touring obstacles, bike touring obstacles, family, fear, friends, health, health concerns, hurdles, husband, money, objections, obstacle, obstacles, wife, work. The comment that helped me the most was about letting your fears hijack your dreams of a bike tour. The 6 pm news is designed to get people to tune in to the latest: (Pick all that apply) terror attack, natural disaster, financial crisis, mass shooting, animal attack. In other words, if it bleeds, it leads. I can’t wait to get out there soon. I’m a commuter now but in a couple years will be retiring which means bike touring. Hey Darren….biggest takeaway from this is that there’s not much so insurmountable that it can’t be overcome with a little logic and desire. What an inspiration you are.. Thank you! Darren, I have been a long time follower of you and your adventures. Since I first signed on I have cycled down Route 66, and soloed Holland for 10 days. I am now 73 years young and I want to do a ride across the US, I think from Portland, OR to Portland, Maine. I know there are established routes but I would like to travel the US Byways and old Federal highways. My main concern is the political climate, mainly in the west and mid-west. I want to have a sag wagon, just because, and I would like to camp most of the way, maybe stay in a motel 1 out of 4 to 5 days to do laundry. What is your opinion of this endeavor? I have moved from Alaska to New Mexico with my partner of 25 years and really want to do this. Your wisdom and opinion would be greatly appreciated. Keep up the great work! You really have made a difference in my life and I know own many others! THANK YOU! Hi Linda! Great to hear from you. Yes, your plan sounds wonderful. Do you have someone to drive the SAG wagon for you? Or would you need to find someone to do that for you? You mentioned you were hoping to do this with your partner. Does that mean the two of you would cycle and the other would drive the car? Or would you alternate between driving and cycling? Also, camping and then staying in a hotel/motel every few days is a great idea! A hot shower, clean clothes, etc… is all very nice after several days of bicycle touring. Keep me posted on your travel plans, etc. I want to hear about it! Thanks for providing such valuable info. I am starting at the age of 63 and have 2 week long guided tours this year with my friend who is 75. My goal is to do the Northern Tier when I am 65 and I agree age is no issue. My concerns as a newbie is the planning of where to stop and camp, food planning and preparation. I plan to do a couple of self contained guided rides next year but then there is the solo or group tour where a guide is not part of it. My biggest challenge is the planning when I’ve never done it before. I’m sure there are videos and books to address this. What is your guidance? Thanks. I have two different resources for you. 1. First of all, have you read “The Bicycle Touring Blueprint” yet? Because that book will teach you everything you need to know about self-supported bicycle touring (the type of bike tour you want to do). 2. Have you ordered the Adventure Cycling Association’s maps of the Northern Tier route yet? Because those maps help you figure out where the food stops are, where the campgrounds are, etc, etc. I’d start there! Hope this helps. I Darren, Iam 66 and live in Canada, I retired 2 ears ago an had work as a bicycle courier years before. I rode to Montreal twice (from Toronto). I own a Raleigh sojurn, on wich I’m planning to ride to Argentina next year. The bike is like a truck, heavy but sturdy. Ihve been following you for 5 years now and keep most of your advise.